A keel laying ceremony for the RSS David Attenborough in October 2016. 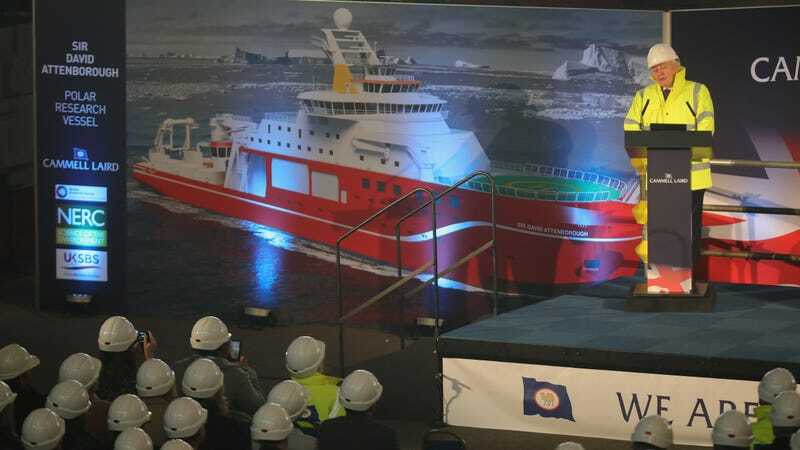 The RSS Sir David Attenborough—the polar exploration vessel that, in April 2016, participants in an internet poll overwhelmingly voted to christen Boaty McBoatface—launched on Saturday, with defensive research officials still defending their decision to override the results of the vote. But she admitted that the furore around the name has helped to generate interest in the £200m ship and to publicise the survey’s mission to investigate whether warm waters are melting the glaciers and ice shelves of the Antarctic from below. “It’s given our mission a more human face,” she said/. The ship is intended to replace the increasingly obsolete RRS James Clark Ross (JCR) and the RRS Ernest Shackleton, the decades-old vessels that comprise the UK polar fleet today. It is equipped with modern scientific gear as well as a “moon pool,” a vertical interior tube stretching across decks and into the water that allows the deployment of scientific instruments in harsh conditions, per the BBC, and could eventually carry three autonomous submarines that could explore the underside of ice shelves. The Attenborough’s mission will include both supply runs to Antarctic bases and hosting scientists studying whether warming waters are undermining glaciers and ice shelves from below. Its thick hull and massive weight will allow it to crush thick sea ice beneath it, allowing it to travel into areas formerly hard to access by scientific missions. However, what goes on in easily gamed internet polls does not necessarily impact ship names. While over 124,000 voted to christen the vessel Boaty McBoatface, outpacing all competition by tens of thousands of votes, officials decided instead to name it after Attenborough, an option which they conceded only got 11,000 votes. One of the three autonomous submarines got the name instead as a consolation prize.